Recent studies of the magnitude 6.0 Napa quake in August suggest that the fault is longer and thus more powerful than previously thought. The main strand of the West Napa Fault Zone was initially thought to span 25 miles, from Benicia north toward St. Helena. But U.C. 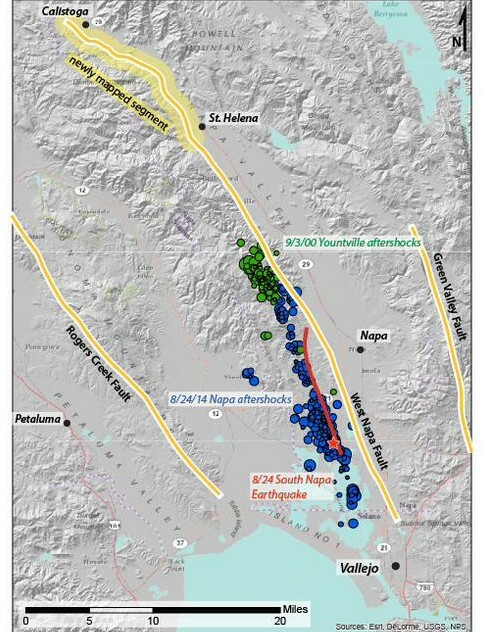 Davis scientists who have scrutinized the local geology in the wake of the August temblor, say that the fault is 45 miles long, reaching nearly to Calistoga. This means more potential slippage, which could mean bigger earthquakes, according to U.C. Davis geology professor Mike Oskin. “Napa Valley and its surroundings shouldn't be complacent," said Oskin. "A magnitude 7.0 would be much more destructive because it would hit the entire wine industry." In fact, scientists have called the August quake an "overachieving 6.0," in terms of the damage it caused and the extent of ruptures at the surface. Oskin and his class mapped the Northern stem of the West Napa Valley Fault, which hadn't been documented as active. There had been no Napa Valley surface rupture in recorded history prior to 2014; surface ruptures are a direct confirmation that the fault is active, according to Oskin. The professor also noticed a line of deformed young gravel deposits along the West side of Napa Valley. Stretching from Benicia north, this young newly overturned rock suggested the fault is active and contiguous up to Calistoga. "One of the things we did was continue mapping that fault," said U.C. Davis geologist Chad Trexler. "We extended that map all the way north to Calistoga, and when we realized it was all on one continuous structure, we started to think about what would happen if the whole fault ruptured in a single earthquake." It's potentially ugly. Trexler says the fault could produce a magnitude 7.0 quake. When the South Napa quake struck in August it was the strongest to hit the Bay Area in 25 years. 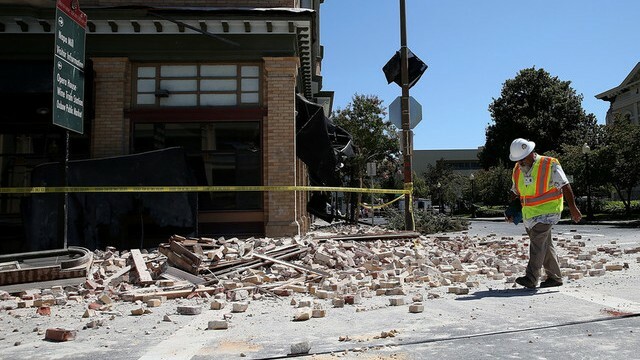 About 200 people were injured and it caused hundreds of millions of dollars in damage to wineries and historic buildings downtown. Scientists with the U.S. Geological Survey revealed this week that the fault is still moving, showing persistent "afterslip," as it's known. In fact, they called it "the fastest-moving fault in the world," with the potential to slip another 2 to 6 inches over the next few years. Scientist say, however, that the afterslip doesn't necessarily portend another imminent earthquake. "We’re very far from predicting an earthquake but we’re closer to knowing where they are likely to occur," said Oskin. "Ideally we’ll get to something more like forecasting the weather in the future." Oskin added a caveat saying even weather predictions aren't foolproof.